Take a look at our video for the new iPhone 8 bulletproof glass on our YouTube channel. Because here you will not only find our video for the Hybrid Screen Protector, but also for the iPhone 8 Screen Protector 2.0 4D. 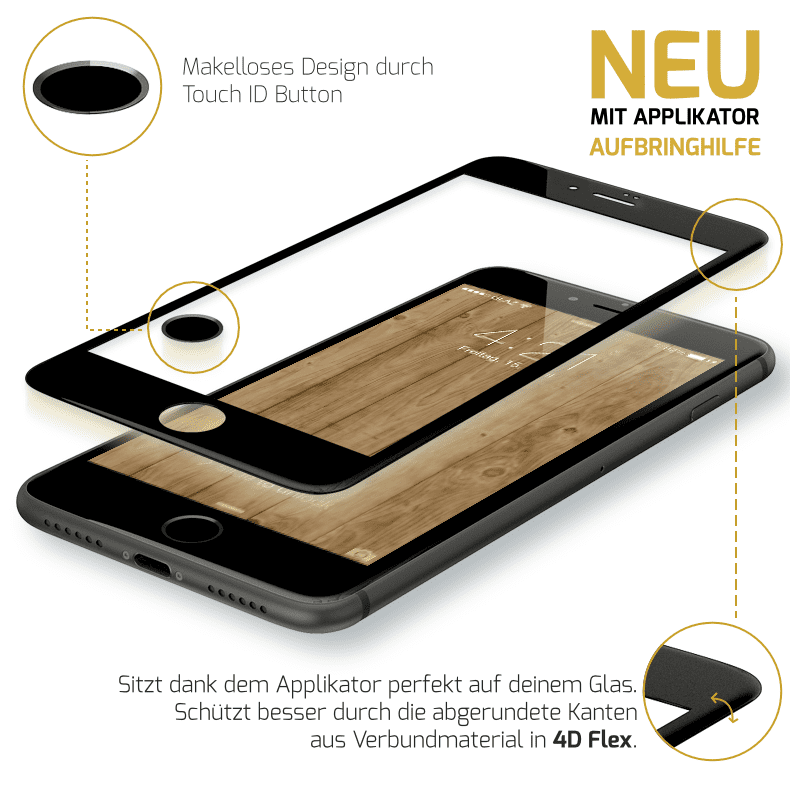 The screen protector 2.0 4D impresses with 100% real glass, unique ease of use and perfect 4D design. Order today the innovative hybrid screen protector. In our new iPhone 8 screen protector hybrid, we have further perfected the design of the protective film. Thus, the glass-layer thickness is only impressive 0.2mm. The iPhone 8 bulletproof glass Hybrid provides an even more intense experience with your Apple smartphone. The unique 4D design of the iPhone 8 protective film gives you 100% screen coverage and maximum protection to the edge. 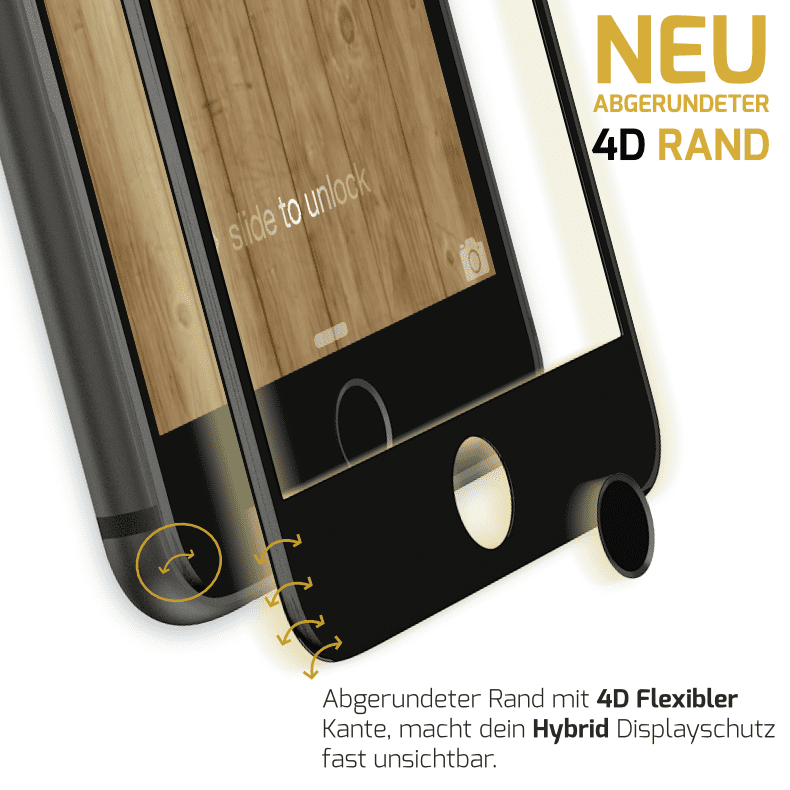 Furthermore, the new 4D Flex edge is extremely resistant to external forces and almost indestructible. Experience and feel the difference to a conventional bulletproof glass film with the iPhone 8 Screen Protector Hybrid. Experience the almost indestructible iPhone 8 protective film. GLAZ relies on innovative composites for its innovative hybrid screen protector. Because these materials make the display protective edges extremely durable and extremely hard in combination with real glass. Neither the iPhone 8 design nor the features of the Apple smartphone are limited. With the iPhone 8 Bulletproof Glass Hybrid you always have a clear view of the important things on your display. The use of a double anti-fingerprint coating not only makes cleaning easier, but also significantly reduces fingerprints. Buy now the new iPhone 8 bulletproof glass hybrid. Never again problems with the installation of your iPhone 8 bulletproof glass with the special GLAZ applicator. 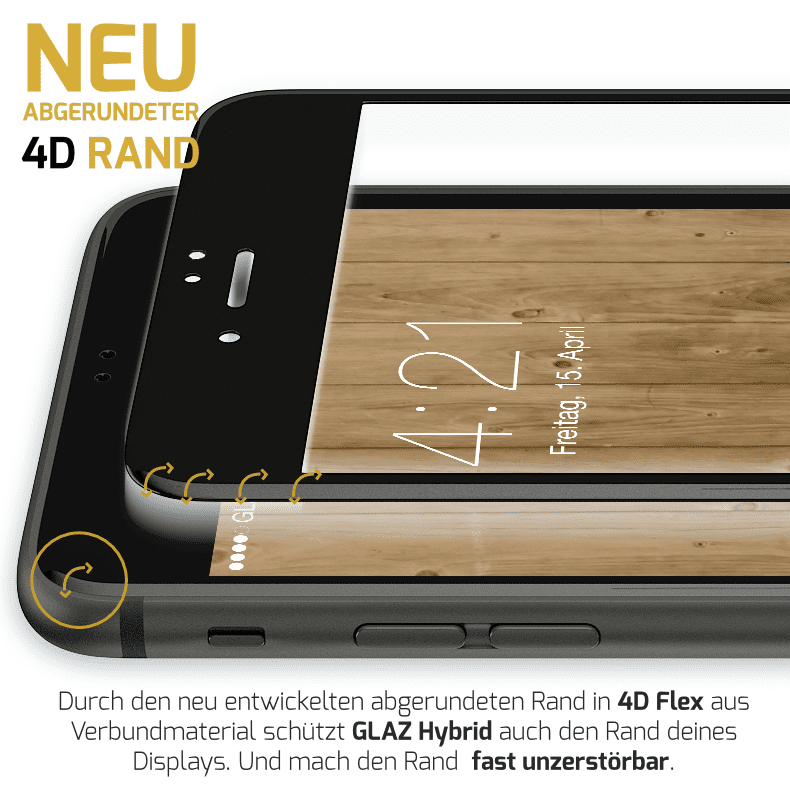 Because the application aid ensures a 100% perfect fit of the protective film on your display. Furthermore, the special coating on the iPhone 8 bulletproof glass leads to an optimal and bubble-free result. Furthermore, you have an illustrated installation guide and an installation video available. 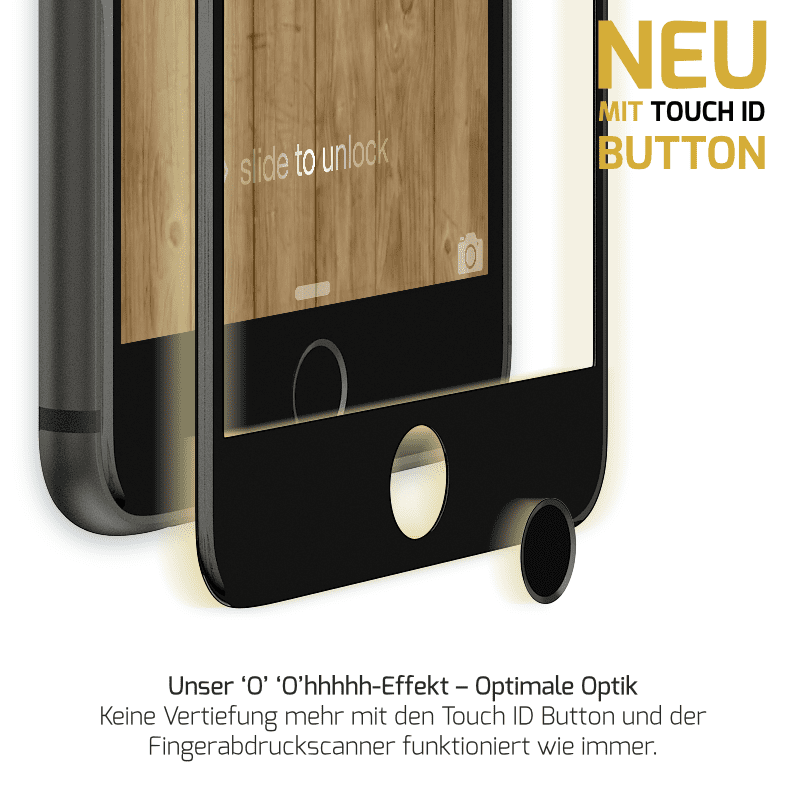 Our TouchID button not only offers protection against wear, but also guarantees unlocking with a fingerprint. Thus, you hardly feel the iPhone 8 protective film and the height difference on the home button. Pure innovation – buy the iPhone 8 Screen Protector Hybrid. If you want to save on screen protection, you definitely save in the wrong place. Because the repair of an iPhone display can be really expensive. So decide better for the premium screen protector from GLAZ. After all, we not only offer you the perfect protection against scratches and other damage, but also unique service. 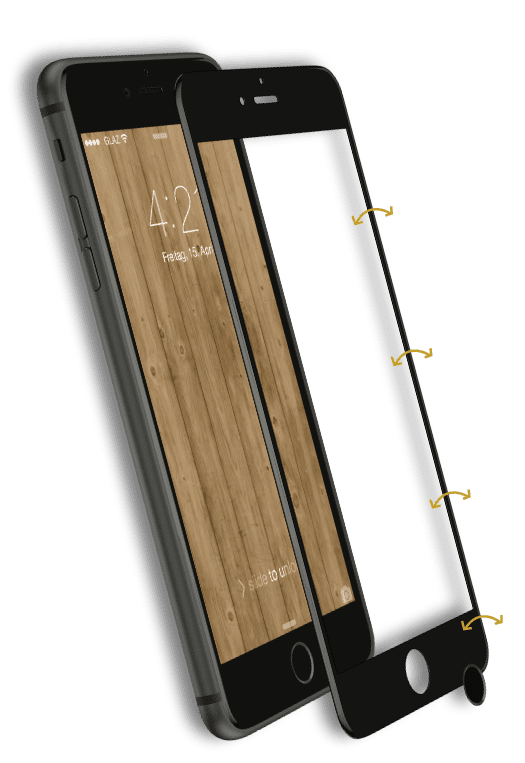 With the iPhone 8 screen protector hybrid we further increase our case compatibility. Because of the impressive thinness of the protective film, the hybrid protection is compatible with almost every iPhone 8 case. Finally, you decide on your lifestyle, your iPhone 8 Case and your screen protector! Feel the difference with the iPhone 8 Screen Protector Hybrid.